1952 Ohio REGISTRATION Sticker Transfer - $20.00 : Bob Hoyts Classic Inspection Stickers, Add a Final Touch to your Restoration! This amazing 1952 Ohio sticker is completely different from any other Ohio stickers. This sticker was issued in 1952 to verify the 1951 registration as there were no plates issued in 1951 due to the Korean war and a metal shortage. This sticker is a faithful restored and reproduced work, identical to the original in which this sticker was taken. This red sticker was given if owner transferred plates from another car. To place your own license plate number plus year/make/model on front can be ordered for an additional $10.00. Ohio never had a compulsary statewide inspection program but did have roadside spot checks to this day. If your car was stopped and passed an inspection you would receive an inspection sticker. 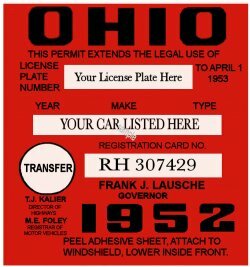 Ohio also had a voluntary inspection sticker used by car dealers in some areas of Ohio as far back as 1945.